Advanced & quick remote support all over the globe. Ability to diagnose, support and solve common PC or Mac related issues. Remove, repair those hard to find viruses, malware, trojans, adware and even junkware. TechnoEXPRESS has always been there for your computer needs and now we can offer even faster service. Now, through the use of state of the art remote support tools, we can assist you in resolving issues remotely over the Internet within minutes rather than hours. 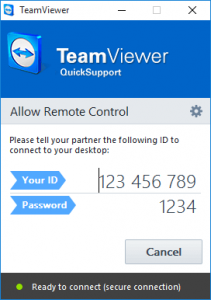 Our remote support software allows us to bring a qualified technician right to your computer, working alongside you just as they would in your home or office over a secure 256-bit connection. Through the use of our easy to use and secure software, you can watch our a trained professional connect to your system and navigate through the issue and quickly resolve it. We can do remote virus and malware removals, provide training on software programs, troubleshoot networking issues, diagnose a hardware or printer problem, or provide you with specialized expert consultations on a variety of technical issues. and giving us Your ID code and Password to remote in.